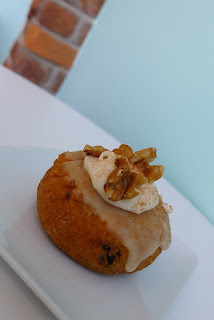 We finally stopped eating the test donuts to snap a few pictures of the delicious Carrot Cake donut! Healthy never tasted this good. Made with 100 percent organic carrot juice, this cake donut is made with walnuts and sweetened with pineapple and orange zest. Oh, and topped with cream cheese icing and ground nutmeg. What's not to love?